Safe Harbour: Fiona Garforth-Bles’s boat, the Henri Lloyd, took top honours in the round-the-world race. Fiona Garforth-Bles lost more than her share of sleep, body heat and even a tooth – but she never let go of her dream of completing two legs in the renowned sailing race Clipper Round the World. “When I was sitting there all cold and wet, I thought ‘at least I am doing something for a good cause,’” says Fiona Garforth-Bles. That dream saw the 53-year-old oncology nurse travel by sea from San Francisco through the Panama Canal to Jamaica, then to New York and across the North Atlantic to finish in London, England. 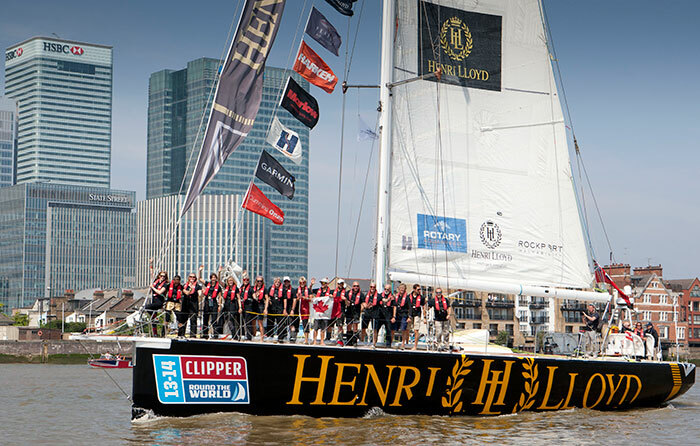 She did so alongside 18 other amateur sailors and pro skipper Eric Holden, who made up Team Henri Lloyd in the prestigious competition against 11 other 70-foot yachts. “It was the hardest thing I have even done,” says the Bragg Creek resident, who has worked at the Tom Baker Cancer Centre in outpatient chemotherapy for nearly 14 years. An avid sailor, Garforth-Bles trained for three weeks in England in spring 2013 before embarking on her international journey this April. In July, after logging more than 8,800 nautical miles, she surpassed her goal of raising $1 per mile for the Clinical Trials Unit at the Tom Baker Cancer Centre – in the end netting $11,436 in donations.